The package is cardboard, hand painted, illustrated by one of the characters that together spell out the title. The first edition has 18 copies. The inlay is a picture which shows the several recording stages of the composition. 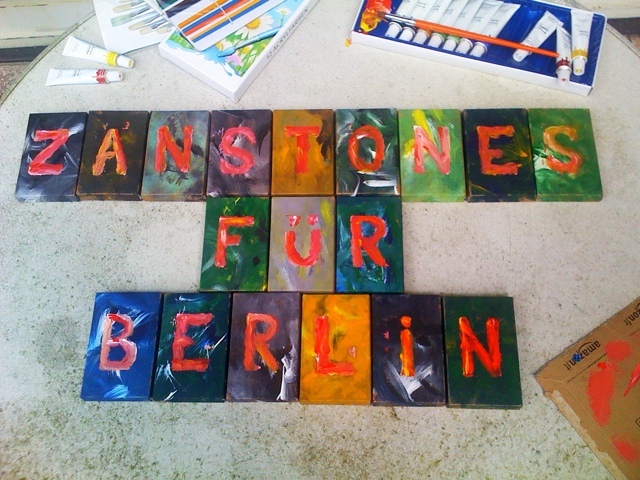 Zanstones für Berlin was recorded and mixed on one single day in Berlin by Zan Hoffman. Not only the city of Berlin was used to provide background noises, also various objects, voices and musical effects got entangled in the overall process. Zanstones für Berlin is a sometimes surrealist journey narrated by Hoffman’s captivating voice and vocals. 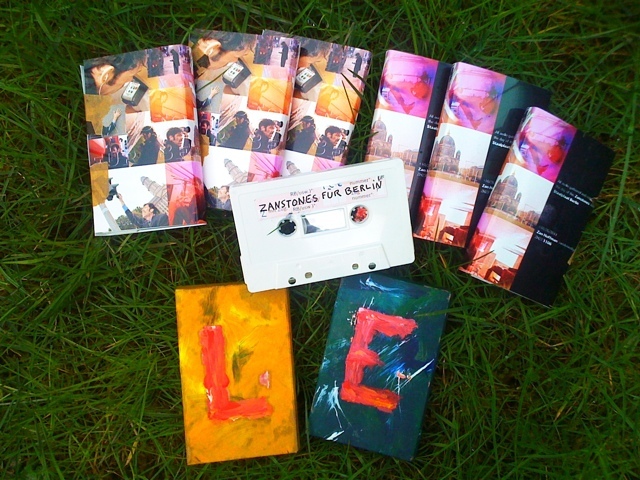 “This cassette is a fairly puzzling audio experience too. I ought to start off saying it is fascinating to listen to and in places has a primitive beauty that is almost incandescent (especially the eerie, insistent drones on side two). But it’s eccentric and strange too. It’s quite some way from the usual things that city-dwelling field recordists bring us back from the city when they create their well-meaning but ultimately rather boring documentary snapshots. 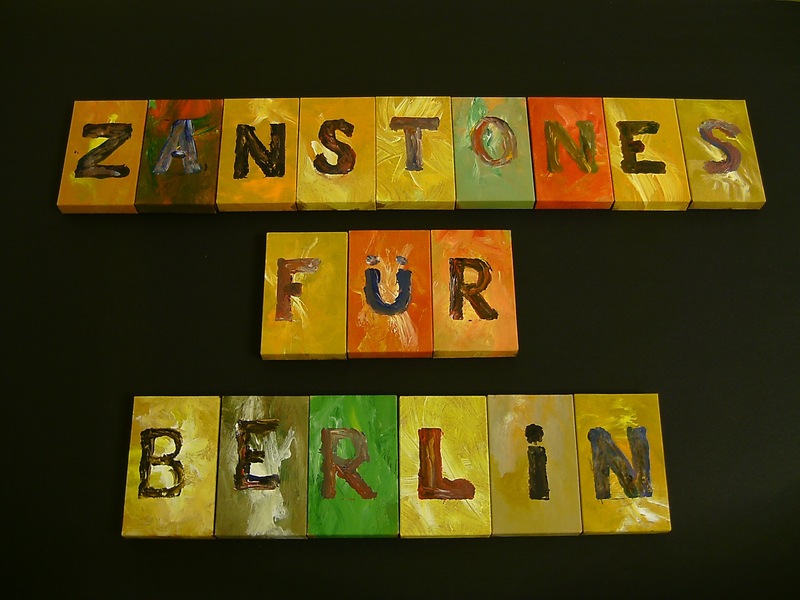 By contrast, Zanstones Fur Berlin is full of highly surprising incident, and amounts to some sort of day-dreaming, ambulatory episode – the recognisable sounds we hear always being undercut or overlaid with very non-familiar things. Hoffman has found a world within a world, or else he doesn’t live in the same place as most normal men. It’s a portable audio installation, a tour around a private art gallery. He somehow remakes the world into his own private space and beholds everything with wonder. The strangest elements on this tape are provided by Hoffman’s muttering, chanting and whispering voice, which cloaks everything in mystery. It might be possible to read these utterances as aural captions for the vitrines in this aural art exhibit. It’s as though we’re having the outside world explained to us by a certifiable madman, speaking urgently in his own private language. Then it dawns on us that he’s not mad at all. The label regards this recording as a surrealist journey, and I’m all for that. I am surprised I never heard of this talented and prolific creator before, considering he’s been around since the 1980s, has his own ZH27 tape label, and has released a large amount of material under his own name and within several groups – including Ambient Complot, Aquabatic Bubble Gum, Bodycocktail, Crow White, Here Be Monsters, JaJa HoLe, Kozan, Masters Of The Ungentlemanly Art, Second Violin, and many more. He claims to be on a 27-year mission “to explore new audio realms”, leaving behind the effluvia of recorded artefacts to mark his journey’s progress. As such he is a cassette hero and fits perfectly into the loose affiliation of Staaltape geniuses, and also owns the sort of unclassifiable mindset that neatly escapes categorisation, always leaping over eighteen hurdles and staying ten kilometres ahead of all the competition. Very high recommendation for this uncanny recording. Now I would like to hear a lot more from Hoffman and ZH27. Zan Hoffman from Louisville, USA started his sound works in the early 1980’s. Unknown to many, he has left an everlasting impression on his peers. Maybe for this reason his close friend Francisco Lopez remixed the recordings of their 1995 Spain tour into “Concert for 300 Magnetic Tapes” , released by tapeworm. 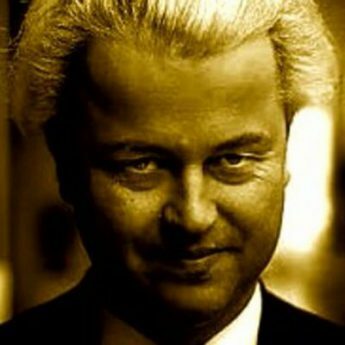 The Dutch national radio “concertzender” dedicated one hour to his works. Listen to ithere. You may want to read more about the part he had and still has in the cassette culture in this interview.